Other Products by Amazonia. Search other Vegan Protein products. 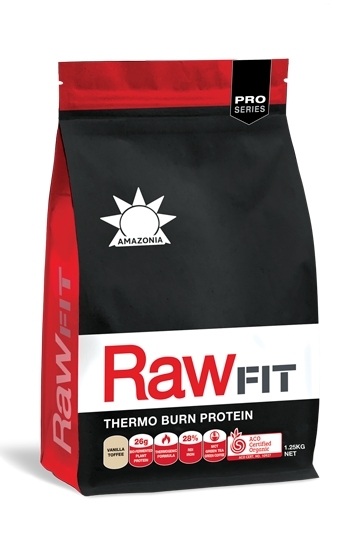 If you're looking for a quality vegan protein hit with the added advantage of some potent fat burners, look no further than Amazonia RAW FIT Thermoburn! This product contains 2 protein powder of irrefutable quality: organic pea protein and organic brown rice protein. Your exercise efforts will be maximised, as a range of essential amino acids winds up the recovery process. For you, this means faster adaptation to exercise. Alternatively, it may be taken as a snack throughout the day. Some of the most well researched natural thermogenics, or fat-burners, are derived from common plants that you are probably already aware of. When it comes to naturally hoisting up the metabolism, there is little more effective than one of the most popular beverages in the world: Green Tea. Because of this popularity, green tea has been widely scientifically researched. Some of the benefits discovered so far (likely more to come!) are antioxidant, anti-viral, anti-cancer, stress-reducing, energy-enhancing and last but far from least; metabolism boosting1,2,3. Green Tea has even demonstrated the rare ability to interfere with the digestion and absorption of fats and carbohydrates, which is good if you are trying to keep your energy intake down4,5,6. On top of this, many other therapeutic fat burners have been added, such as Green Coffee, Yerba Mate and Coleus forskholii. Not only do these remarkable plants gently support your metabolism, but they also deliver other benefits, just like Green Tea does, such as an antioxidant effect. It is also interesting to note that during aerobic exercises, like jogging or swimming, the body generate free-radicals from oxygen, called reactive intermediates. Scientists believe aroud 3 to 10% of oxygen is converted to free-radicals7. So it's not such a bad idea to have an extra source of antioxidants up your sleeve when your hitting your weekly cardio targets and forging a path to body-composition victory. Amazonia RAW FIT FIT Protein contains natural sweeteners and flavours, an organic gum to improve mouth-feel, himalayan pink salt for an added boost of microminerals and flavour and a plant-based digestive enzyme called papain. Papain is found in papaya, or paw paw, having the highest concentration in the green unripe fruit. This enzyme is termed proteolytic, which means it assists with protein digestion. And hey, guess what? These little ezymes may even improve the bio-availability of protein powders by increasing digestive efficiency and amino acid, dipeptide and tripeptide absorption. This means better results for you, and perhaps even more bang-for-your-buck! 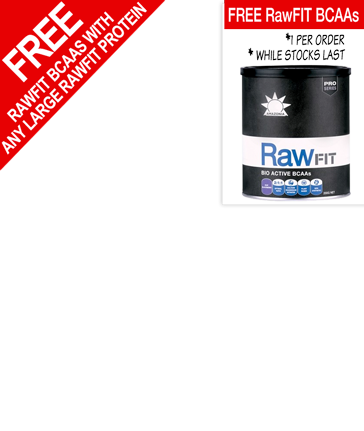 Amazonia RAW FIT FIT is unsurprisingly another fantastic 100% VEGAN Protein Powder from AMAZONIA that ensures your amino acid needs are covered, your metabolism is boosted, and your wholistic health uplifted. Mix 2 Level Scoops (35g) into 300ml water and shake or mix. Alternatively, try with non-dairy milk, blend into smoothies, or incorporate into baked products.